Ixia's PerfectStorm ONE network test and assessment solutions are developed specifically to make BreakingPoint solutions available in a compact form-factor for enterprise IT, operations, and security personnel. PerfectStorm ONE condenses Ixia's PerfectStorm massive-scale, stateful layer 4-7 testing platform to now support the enterprise. Scaling from 4Gbps to 80Gbps of application traffic simulation, PerfectStorm ONE supports a buy-only-what-you-need business model to align with enterprise budgets and future-proof your growing test needs. With Ixia’s PerfectStorm™ load modules and XGS12™ chassis, BreakingPoint offers an all-in-one security and performance testing platform for massive-scale, stateful layer 4-7 application and security testing. It provides near Terabit levels of mixed application and malicious traffic to test all elements of today’s complex data centers. PerfectStorm blades are powered by the XGS12™ Rackmount Chassis. 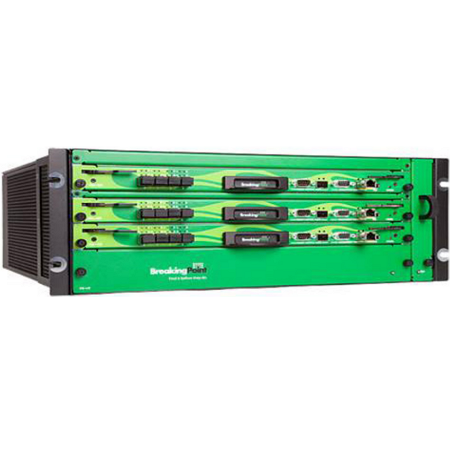 The 12-slot modular chassis is the industry’s highest port density Ethernet test system available. It is the flexible platform that delivers the most comprehensive solution for performance, functional, and conformance testing of network equipment and network applications.